For Christmas this year, we drew names among siblings and niblings (nieces and nephews), each person buying a gift for one sibling and one nibling. I enjoyed buying gifts for everyone in previous years, but with 7 siblings and 7 niblings, drawing names was definitely easier! I drew Maria and Lisa Beth's names, and was happy when they wanted things I could make for them. I got a few smaller things to go with the gifts, but the following were things I was able to sew for them. It definitely made the gifts more personal and fun to give! One tip: when making gifts, don't wait until the last minute! Because of all the busyness leading into December, I did. I bought all the fabric way ahead of time, but the week before we needed to leave was the time I actually began sewing. 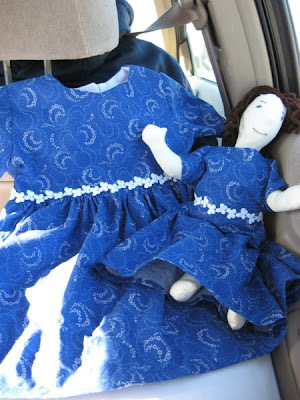 I furiously sewed Friday morning trying to finish up, and ended up having to finish sewing the doll's dress by hand in the car. After sewing only that little thing by hand, I am very thankful that I have a sewing machine and don't have to sew my big dresses by hand! 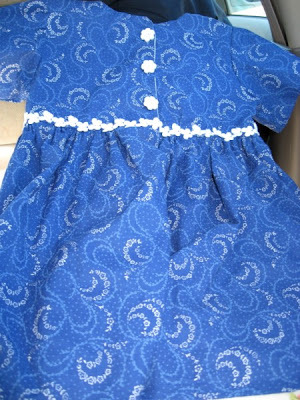 Lisa Beth's dress was made using McCall's patter 2053. I think it's out of print now, but Michele graciously lent me hers. I had fun finding the pretty blue fabric with white daisies, and added the white flower trim and the white flower buttons. Little girl's clothes are so cute to make! 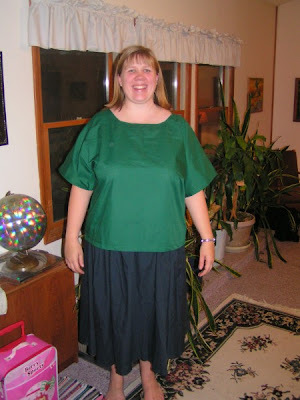 I made Maria a skirt and shirt, getting her fabric color requests. I used Simplicity Pattern 7141 to make both. The skirt is from the same pattern as the ones I made for the Ruth musical and later used in the Mary musical. They're very full and pretty! I think Lisa Beth liked her dolly. =) She's only 1, so I don't think she noticed the matching clothes very much, but it was very cute to see her wearing her dress! How sweet! Homemade gifts are so much more personal. The matching dresses are adorable! Little girls clothes are certainly fun and cute to sew! Thanks again:) And I was surprised by Lisa Beth's dress...I didn't expect you to make it for this holiday, I had meant maybe one day in the future. Liza Beth's doll and outfit is adorable!